For years I have run sled dogs. Sledding requires enormous physical abilities and efforts.Well, I’m getting no younger, and a few years back I seriously injured a hip when I slid off the icy runner and was dragged a few yards. I’ve curtailed my dog sledding ever since. So I adopted a greyhound. And went lure coursing. Now this is the life for those of us of advanced age and deteriorating muscle tone! Let me explain. Lure coursing consists of loading a well-conditioned dog or two in a van, getting to a nice open field with a bunch of other unfit human specimens, waiting your hound’s turn, walking him to the starting point, releasing him, watching him do his thing, putting the collar back on him when he reaches the end of the course (which is at the same place as the start), and then walking him out so he can cool down. What a gas! You could do all this on crutches! My spirits soared the first time I went coursing! Finally something I can do with my dogs that doesn’t require me to visit the sports club every week. And there are other fat, soft, out-of-breath people there participating, just like me. I became a fanatic. Nancy Hudson's dogs would probably be excellent at lure coursing. My sweet ex-racer Handy had been getting really depressed because he missed the racetrack. 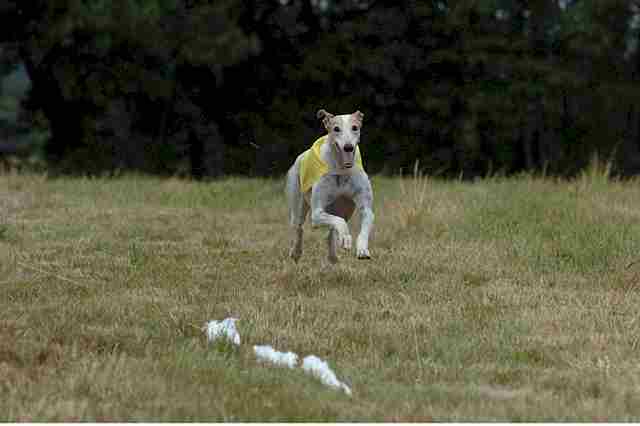 At the first coursing trial, where he just got to do a practice run by himself, his eyes lit up. He knew immediately what that sound was, and he focused right on the white garbage bags that were flying around the course. He leapt in the air with joy and started screaming. I had never heard him make that noise before. He nearly dragged me off my feet. My sedate, gentle hound had become a monster. I was scared to death. What would happen when I released him? Would he ever come back to me? Was I out of my mind? Didn’t my adoption group warn me to not ever let him off lead? But the others were trusting their hounds, and I couldn’t embarrass Handy or myself. So when our turn came, I let him go. My stomach dropped out of my body. I was sweating and shaking. Handy raced after the lure like the pro he was before I got him. I glanced at the luremaster (the man running the lure machine). He had a big grin on his face. His name was Dean Wright, and I knew he was in charge of the AKC lure coursing program, so he ought to know what he was doing. Handy kept on the lure until a sharp turn very near a fence. He went wide, and ran into the fence. We could hear the impact. He stood up and shook his head. Dean stopped the lure. Handy went over to the bag, not limping, and Dean ran the lure just a few yards further, then stopped it and told me to go collect my hound. I ran across the field to him (when you need to you can run), slipped the lead on him, and Dean and I checked him over. He seemed to be all right. Dean told me how to walk him out till he was cool. That was the beginning. Very quickly he learned about the abrupt turns and switchbacks on courses, and he was certified to compete with other dogs. He started winning! The first time he won a course, he was going so fast that at the end of the course he went head over heels, landed on his back with his little racing blanket over his head, still hanging on to the lure. He doesn’t do stupid things any more, and he continues to place well in competition. He loves to course, and I love to watch him. Sometimes the lure hangs up on a pulley and stops. At that point the handlers pick up their hounds for a restart. All the fat unconditioned people run or walk fast across the stubble of the field. The hounds stand there waiting for action. The handlers reattached the slip leads and the dogs are off again. The handlers have to stand out of the way and then walk or run fast back to the end of the course, where usually someone has hold of the hound. Gasping people who have walked all that distance slip their leads back on the gasping hounds who have just run their best, and the course is over. 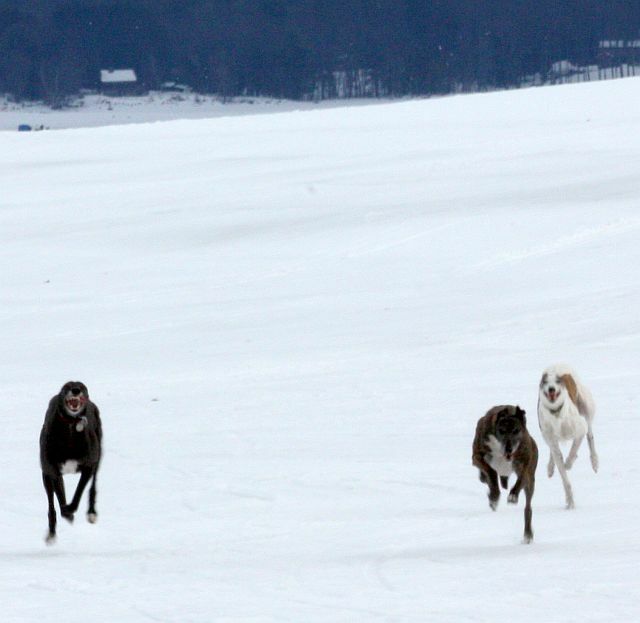 There is simply nothing more beautiful than seeing a good Greyhound run. It is poetry in motion. The hound hardly seems to touch the ground — he is flying. His mouth is open in a big grin and his little ears are flat against his head. His tail whips back and forth on the turns. The day came when Handy won Best in Field (overall winner) at a trial. It’s a very subjective part of a trial, because different breeds have different styles of running and the choice is really more by preference than by actually winning. But it’s a real nice rosette that hangs in a place of honor in my living room. That day I was so surprised and touched that I actually cried at the awards ceremony. My dear hound, whose racing owner had given up on him because he was no longer winning enough races, had entered a new life and was being honored as well he should be. Heck, he doesn’t care about the rosettes — he just wants to have a chance to feel his beautiful muscles work, and to feel the wind on his face. Yes, Handy, as long as you want to run I’ll give you the chance. You deserve it. Tally-ho, my love!